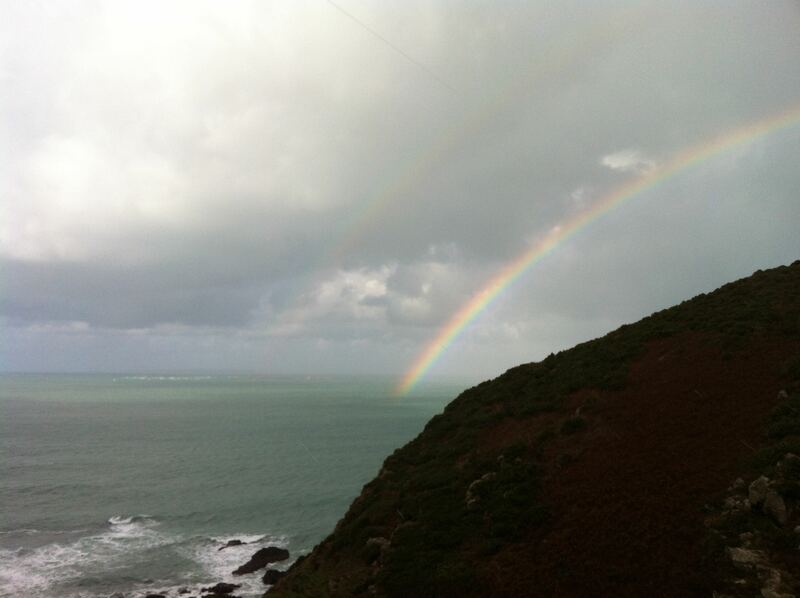 In October Adam wrote about his time with the choughs on the sunny north coast of Jersey. 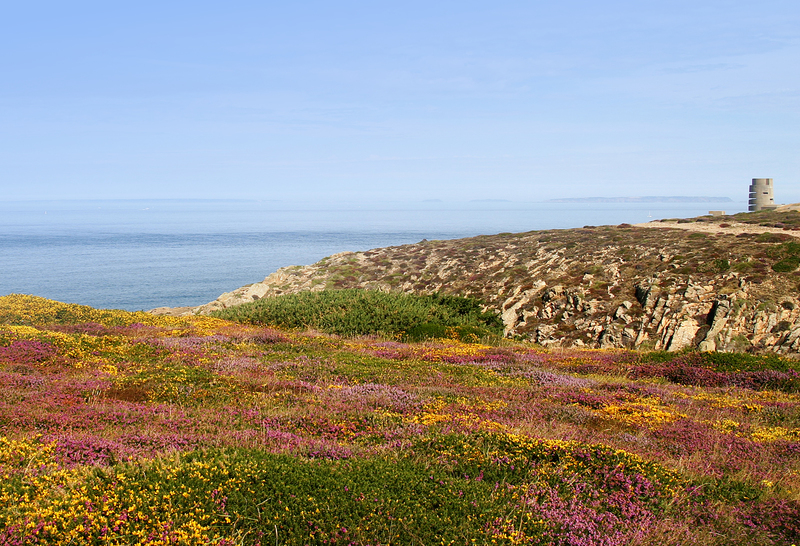 However, it’s not all sunshine and calm days on our coastline and here Will recounts his time following the choughs into a Jersey winter. 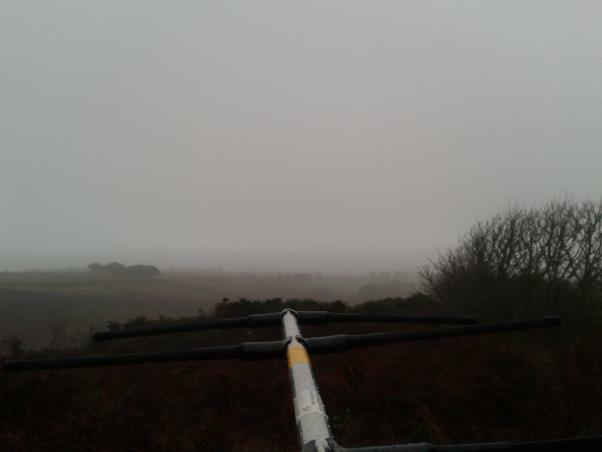 My toes are numb as I squeeze my way past gorse bushes and through muddy fields, arm and radio antenna outstretched, feverishly waiting for the reassuring ‘pip’ from the SIKA that indicates a nearby chough. Because, once you have found one chough (the ‘Judas chough’ as fellow volunteer Jenny calls them), you can be pretty sure that the others are nearby. I trudge, stooping into the wind, to a high point and wave the antenna in every direction for what seems like the hundredth time. At last a faint ‘pip’ comes through the SIKA slung over my shoulder. I look anxiously ahead into the wind and rain but instead of the familiar acrobatics of a chough I see nothing but a thick sea mist. Dejectedly I trudge on, in the vague direction of the ‘pip’ in order to pinpoint their location. It’s at times like these when some people might ask, ‘Why?’ And I tell them that although data collection isn’t easy, no matter how minute and irrelevant it may seem, it is absolutely necessary to build the bigger picture. 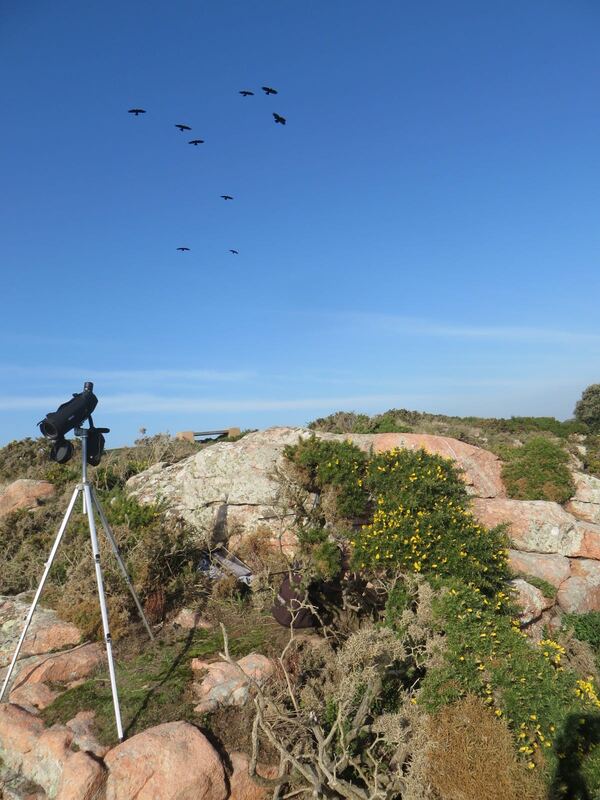 A big part of my time with the choughs was spent radio tracking them – essentially finding out where they were and how far they were from their mates. Doing this up to eight times every day allows you to amass a huge amount of data, which can in turn help answer loads of questions in matters such as social sub-groups, home range, and even potential breeding pairs and nest sites come the spring. Although I’ve painted a pretty grim picture at the start of this piece, I did in fact experience all four seasons in my four months up on the north coast, sometimes, it seemed, in the space of one day. At 8am I might be huddled with the sheep in what little shelter there was from the wind and rain, and by 11am I could be sunbathing in a field, cursing myself for forgetting my sun cream. The most extreme weather I faced up at Sorel was during gale force 8/9 winds where simply walking from A to B was a challenge. Even the choughs were wisely sheltering in the aviary from the onslaught. Harriet and I noticed an upturned kayak in the sea and, fearing the worst, she called the Coastguard. It didn’t take long for a search plane to arrive and start scouring the sea. Luckily, it turned out the kayak had never been occupied and the plane turned back to what must have been a very bumpy landing. It was during the warmer half of my placement that the choughs decided to clock some air miles and check out what the rest of the Island had to offer. This left us frantically driving around the west of Island, but ‘as the chough flies’ is a much quicker way of getting around than ‘as the Skoda drives’. 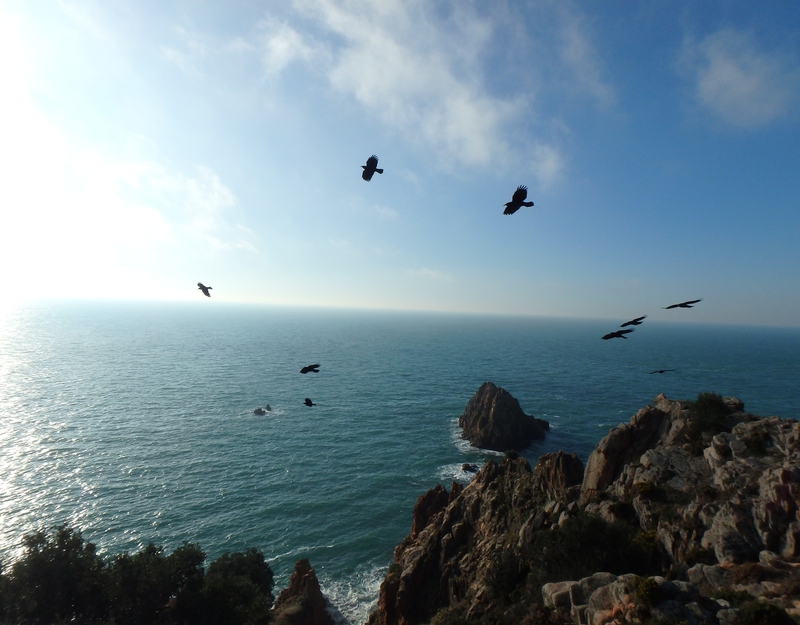 It was only due to the very welcome tip-offs from local bird-watchers that we were able to find the choughs down at Beauport probing amongst the cliffs; apparently oblivious to the panic and excitement they caused us. It was incredibly rewarding to see the previously captive birds exploring the island and always making it back to the aviary with impeccable timing to demand their lunch. 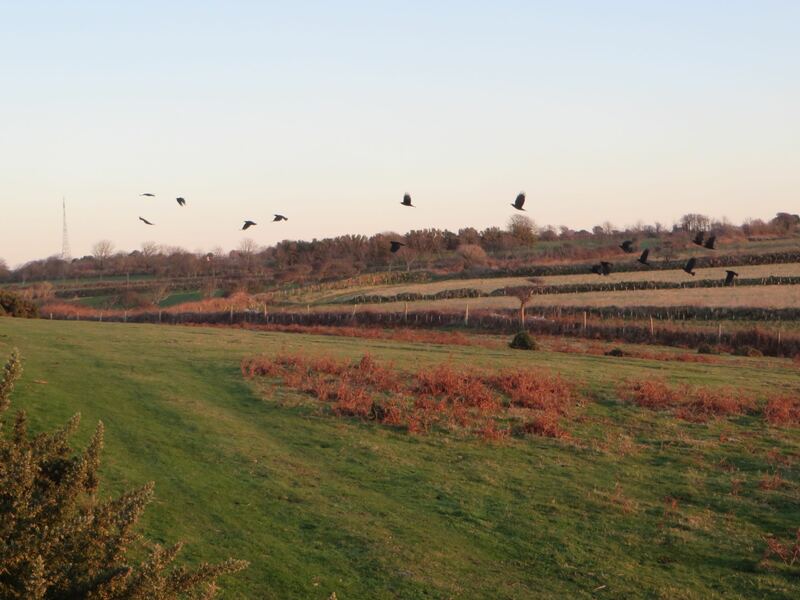 The choughs seem to have an uncanny ‘spider sense’ when it comes to feeding time. The idea is that, once you have put out the dishes, you give a tinnitus-inducing blow of a whistle and the choughs appear in unison to merrily scoff all the food. The birds have been trained to the whistle to try and give us an element of control, for example if they need to be shut in the aviary. In practice, however, the choughs are canny little birds and seem to react to the subtlest of cues such as the gentle clinking of dishes, the opening of a door or even a Durrell jumper walking towards the aviary. The result is always the same. By the time you have put the dishes out and raised the whistle to your lips all 16 birds will be lined up along the exterior aviary shelf, begging with their wings open and squawking to express their irritation at having to wait for their dinner. During the afternoon feed, when insects are scattered and hidden in pine cones and under logs, you have the delight of witnessing an ‘Easter Egg Hunt’ as the birds frantically waddle around the aviary trying to be the first to find the delectable wax moth larvae. 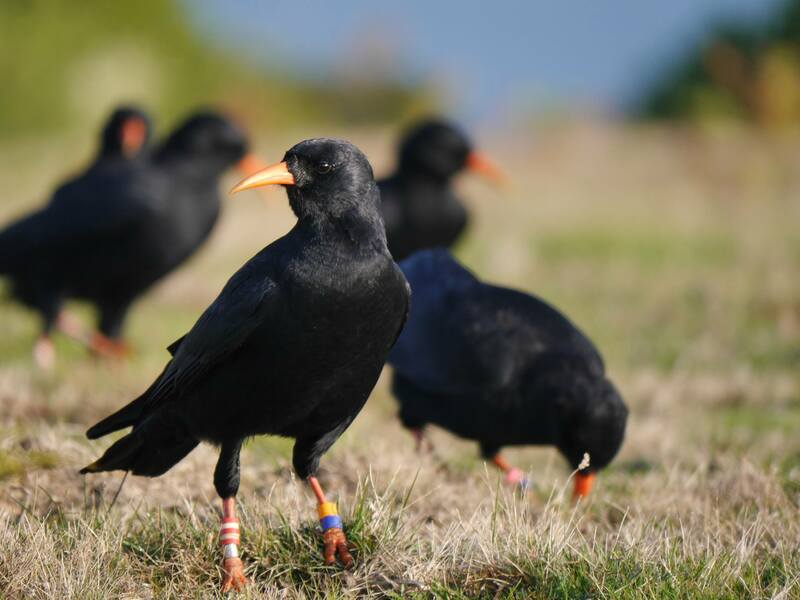 Another ongoing study that I was involved with was a pitfall-trapping survey in order to gather information about the choughs’ available food sources. Unfortunately I didn’t have the chance to look into the other end (literally) and sift through chough poo to see what they were actually eating. As I have a weird fascination with invertebrates and had gained some experience in stream-dwelling bugs during my degree, I was appointed the authority on all things creepy and crawly and was instructed to create a pictorial guide to the invertebrates previously found at Sorel. This soon turned into an 80+-page monstrosity that I sincerely hope will be of use to the other volunteers and staff (other than to prop up their computer screens). It was a challenge at first to identify the unique coloured rings around the legs of each bird, let alone remember which bird the rings belonged to. But after a while you can even guess which birds hang out together and, at the risk of anthropomorphizing our feathered friends, understand their individual characters. The love triangle between Dingle, Chickay and Caûvette (and Caûvette’s incessant whining) wouldn’t be out of place in an episode of EastEnders. Although you shouldn’t choose amongst your children, Chickay is definitely my favourite. When you watch the choughs for as many hours as I have you see them do some pretty bizarre things. It always seemed to be Chickay that would hang upside-down from the aviary netting like a bat, groom a sheep or chase butterflies with her peculiar waddle. 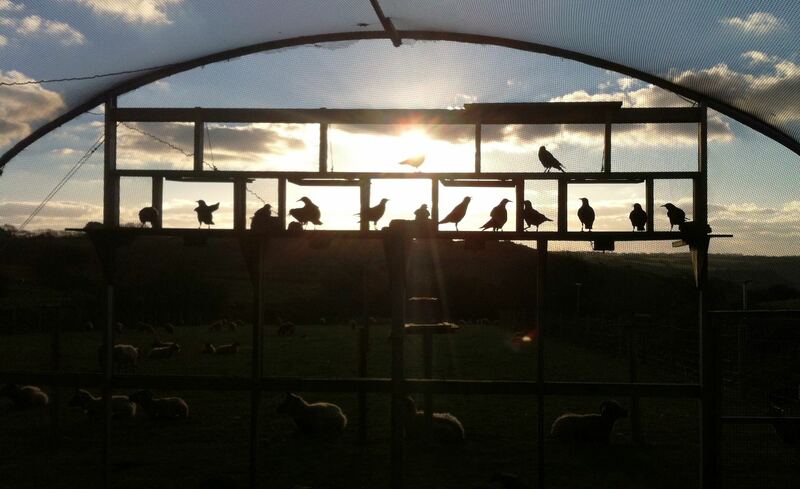 Reluctantly, my time with the choughs has come to an end. It has been a great experience working on the reintroduction project, and to be part of such an important and exciting project in its infancy. All that is left to say is a big thank you to Liz, Harriet, Glyn, Jenny and everyone at Durrell for making my placement unforgettable. 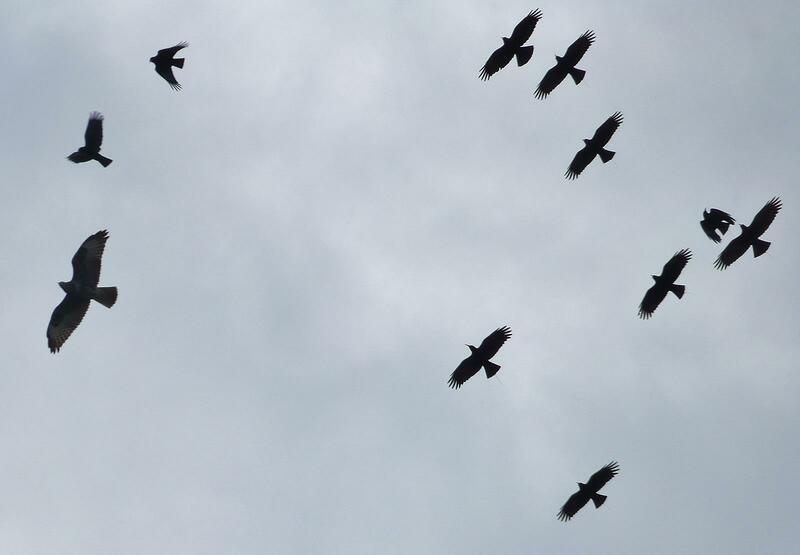 And, of course, thank you to the 16 choughs (you know who you are) that kept me company up on the cliffs. Oh, and thanks of course to the sheep for sharing their best spots to shelter from the rain. I sincerely hope that all the hard work, dedication and frostbite bears fruit once it comes to the breeding season! Fantastic piece, Will. Really well written and interesting. Keep up your work in conservation! Great, this conveys the experience very vividly. I spent two years engaged similarly in West Wales living in a camper van, chasing choughs (no telemetry) from dawn to dusk all seasons, so can sympathise (and be slightly envious!). As to birds cognitive skills, can you believe this? At one site, during the summer high season (for human visitors), I’d ensconce myself at a vantage point tucked down in a favourite hiding place and yet ‘my’ choughs would spot me from across the bay despite all the tourists, come over to swoop low overhead, calling and then return back to their chosen feeding site across the bay. This happened so often that I was left in no doubt they recognised me and came over to say “hallo”. Anthropomorphic? I honestly don’t think so. It reminded me of when visiting a zoo where I used to work after some many months (Cotswold Wildlife Park) some birds and primates would recognise me in the crowd by the cage and set up greeting calls. I’m sure other keepers at Durrell will have had similar experiences. Wonderful read – made me laugh, taught me more about the project, and upped my respect for you chough followers in equal measures! Great read Will, the birds are missing you!! Will you write so well, loved reading this. choughed about your report….keep your pecker up.?? Great stuff Will! I know your efforts were greatly valued and appreciated. Great read Will, a literary career beckons in addition to the conservation.